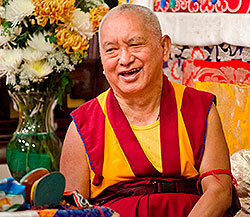 Lama Zopa Rinpoche at Land of Medicine Buddha, August 2012. Subscribe to our RSS feed on Rinpoche’s Schedule page to receive updates as soon as they are available! The full advice can be read on fpmt.org. Verses to Inspire Offerings, composed and arranged by Lama Zopa Rinpoche, is available as a frameable printed prayer card. Rinpoche wants these verses displayed in any center that does extensive offerings. Eight monks and three lay people passed the first Basic Program final exam at Nalanda Monastery, France, which has had more than 80 participants over the past five years. Two Basic Program students at Tse Chen Ling in San Francisco, California, completed their three-month review and passed the final exam, with graduation to follow soon! After three successful rounds of the Basic Program, Chenrezig Institute, Australia, will offer over 18 months in 2012 and 2013 in-depth study of the Masters Program “Middle Way” teachings to 21 Sangha and seven lay students. Khadro-la identifying to Lama Zopa Rinpoche where one of the large stupas to minimize potential damage from an earthquake should be built, San Francisco, California, United States, 2012. After receiving news that scientists were forecasting a huge earthquake and possible tsunamis on the West Coast of the United States, Lama Zopa Rinpoche asked Rangjung Neljorma Khadro Namsel Drönme (Khadro-la) what could be done to minimize the potential damage to people and property. Khadro-la advised that two stupas – one in California and one in Washington State – be built. FPMT is now undertaking the building of the two large stupas and is in the processing of identifying land, based on Khadro-la’s advice after her recent visit. The cost of these two stupas is approximately US$150,000. All donations are welcome. You can read more about the Stupas to Minimize Harm from the Elements project here. 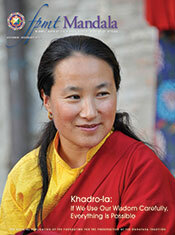 Also in this issue, an excerpt from the new book by Lama Zopa Rinpoche, How to Practice Dharma: Teachings on the Eight Worldly Dharmas; a profile of Geshe Kelsang Wangmo, the first female geshe; plus news and updates from FPMT centers, projects and services around the world. Get a 40% discount when you purchase our Flower Greeting Cards. These cards feature inspiring quotes from Lama Zopa Rinpoche with beautiful original color photography of flowers, and Rinpoche wanted these cards to be made widely available. Composed and arranged by Lama Zopa Rinpoche, Rinpoche would like these Verses to Inspire Offerings to be displayed in any center, project or service that makes extensive offerings. This advice has been added to Rinpoche’s Collected Advice for FPMT centers, projects and services. Amitabha Hospice Service in New Zealand has kindly made available their guidelines regarding how to talk about death, signs of dying, and creating a Dharma will. His Holiness the Dalai Lama with Ven. 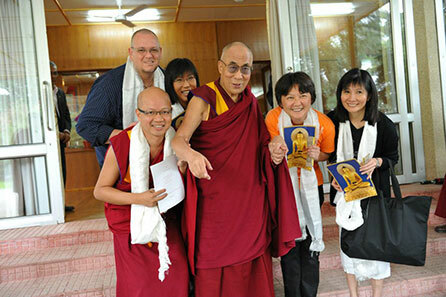 Sonam, Adam, Selina, Pik Pin and Kim during the private audience organized by the Vajrayana Buddhist Council of Malaysia on August 31, 2012 in Dharamsala, India. We are very pleased to inform you that the FPMT Spanish Translation Service has created a non-profit publishing house, Ediciones Mahayana, together with an online shop, with the aim of making publications prepared by FPMT Education Services available in Spanish for study and practice. 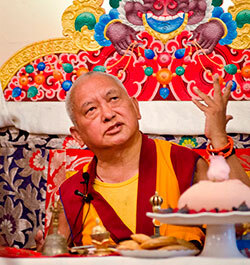 Consejos esenciales para el momento de la muerte and Prácticas esenciales para el momento de la muerte by Lama Zopa Rinpoche are already available. Please visit their website to stay updated on their new titles. 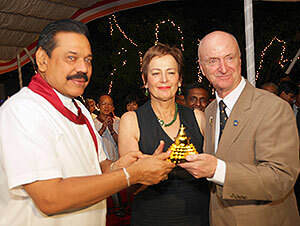 While the Jade Buddha for Universal Peace tour was in Sri Lanka August 10-19, Ian and Judy Green presented a model of the Great Stupa of Universal Compassion to Mahinda Rajapaksa, President of Sri Lanka. The President asked for a special showing at the Presidential Home and attended morning and evening pujas on both days in front of the Jade Buddha. FPMT Mongolia is looking for a chief operating officer; Root Institute, India has openings for seasonal volunteers in these positions: kitchen manager, office manager, office assistant and shopkeeper; Milarepa Center, USA is looking for an administrative manager. Tong-nyi Nying-Je Ling’s hospice service project changes its name to Pure Land of Medicine Buddha, to better follow Rinpoche’s recent advice about hospice service names.